Easter is almost here! Easter baskets are a fun and creative traditon to share with your children and loved ones. Our Heart Felt Soaps make a beautiful addition to any Easter basket. 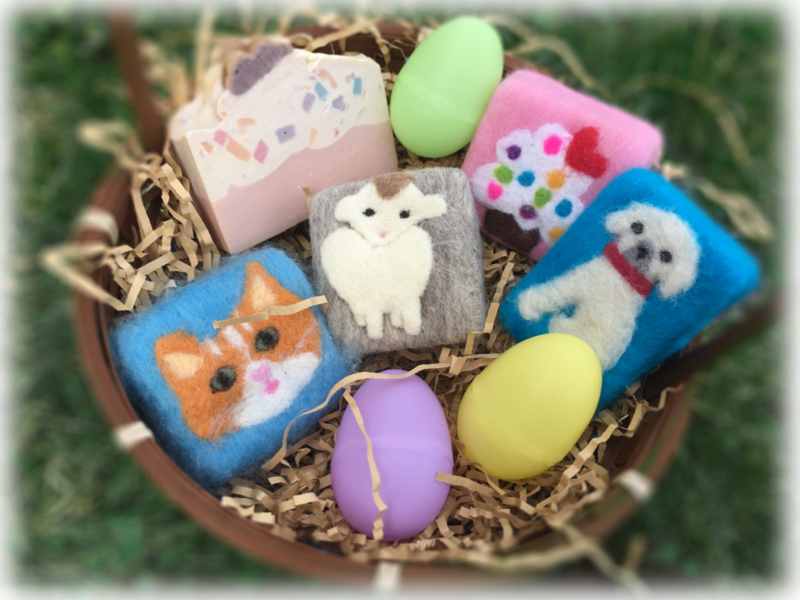 Felted soaps featuring Sheep, Kitties, and Puppies will be an adorable addition to your children’s Easter baskets and will be an Easter highlight for your children. Also, our Cupcake soaps make a wonderful “sweet treat” and come in three different spring colors. We also have a special new cold-processed soap shaped like an elegant slice of cake called Celebration Cake! There is a limited suppy of Celebration Cake, so you will want to get your slice today! These amazing soaps are Easter basket goodies that parents can feel good about and children will love. These handcrafted soaps will be a gift that lasts long past Easter. Your child will enjoy the beautiful scents and fun designs, as well as having all the benefits of using our natural, handmade soaps. Also, you will at the same time be giving the “Gift of Work” to our hardworking artisans. What an incredible message to share with your children this Easter! Order soon so that we can ship them to you in time for Easter!